“They joke, roll and whirl around. Feel this groove in your heart”. 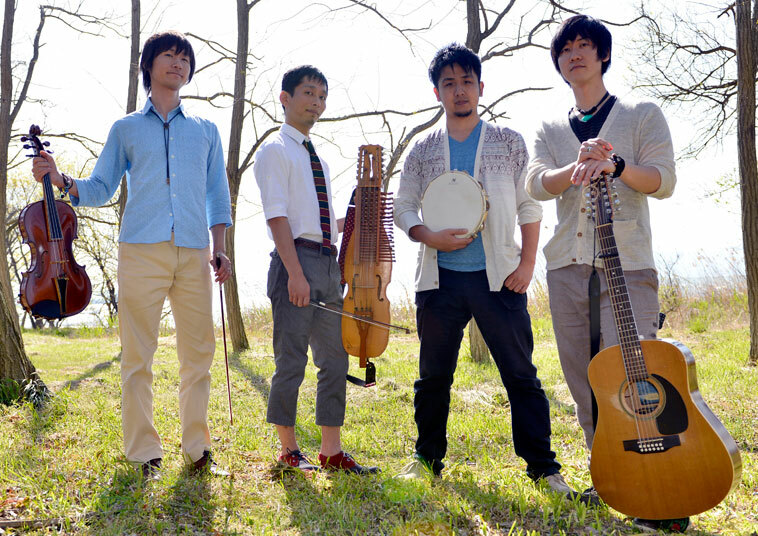 This is how this Japanese band in love with Scandinavian traditional music announce themselves on their web site. Formed in 2006 in Kyoto, Japan, they perform both traditional and original tunes inspired by Scandinavia. Yuki Noma is the founder and leader of the band. He can play virtually any kind of music including the traditional music of both western and eastern Europe, and is the composer and arranger for most of Drakskip’s tunes. Shouta Enomoto plays the fiddle and the nyckelharpa (very rare in Japan), and lived in Scotland from the age of eight to fourteen, so his experience includes performance in ceilidh bands as well as orchestras, chamber music ensembles, and jazz bands. Yusuke Urakawa plays the 12-string guitar, which he started in junior high school playing street gigs with his friends. He is frequently a guest artist for other music professionals. The group is completed by percussionist Yosuke Watanabe, who was inspired to his profession by seeing the Japanese drum troupe “Kodo” when he was seven years old. The quartet have an original and contemporary flavour, and have worked with various famous artists, including LAU, Valkyrien Allstars, FRIGG and Goran Mansson. Drakskip have a passion and strong desire to show the world the kind of magic that can happen when young Japanese musicians of superior artistry fall in love with Scandinavian traditional music.